[Download Text]  Images are free to use for press purposes; please credit Old West Events. Brian Lebel’s annual Cody Old West Show & Auction is celebrating its 2nd year in Santa Fe, and its 30th overall, this June 22nd-23rd, featuring a weekend vendor sale of cowboy, Indian and western Americana, along with a live Saturday night auction of authentic western art and artifacts. SANTA FE - This June 22nd and 23rd marks the 30th anniversary of Brian Lebel’s Cody Old West Show & Auction, and its 2nd year at its new home in Santa Fe, New Mexico at the Santa Fe Community Convention Center. The weekend vendor show hosts 130 national dealers, and the Saturday night auction will see over 200 lots cross the block, with presale estimates exceeding $1 million. Both events feature authentic cowboy, Native American and western art, antiques, apparel, décor, jewelry, collectibles, antique firearms, Native American artifacts, photography, boots, books and other fine western merchandise in all price ranges. General admission to the Show is $10 per day; the Cody Old West Auction is free and open to the public. Discount Show tickets, auction catalogs and complete details online at oldwestevents.com. The Cody Old West Show packs the Convention Center with over 130 vendors from across the country, offering antique, vintage and modern items in prices ranging from $5 to $500,000. Everything from furniture to fine art, and cowboy spurs to cowgirl skirts will be represented, and all vendors are required to accurately represent the age and authenticity of their items. Thousands attended the 2018 event, which was its first year in Santa Fe. Show founder Brian Lebel (a Santa Fe resident) is hoping to build on last year’s success. “We are really pleased with the success of our inaugural year in Santa Fe,” Lebel says. “So we’re making an even bigger investment in local marketing and advertising this year in hopes of solidifying a place as one of the City’s ‘must-attend’ summer events.” General admission hours for the Show are Saturday, June 22nd, 9 am to 4 pm, and Sunday, June 23rd from 10 am to 4 pm. Tickets are $10 per day; guests under 12, over 70, or active military receive free general admission. Patrons of the 70th annual Rodeo de Santa Fe receive free admission with their Rodeo ticket stub. $100 early/VIP buy-in is offered during vendor set-up on Friday and is good during all weekend vendor hours. 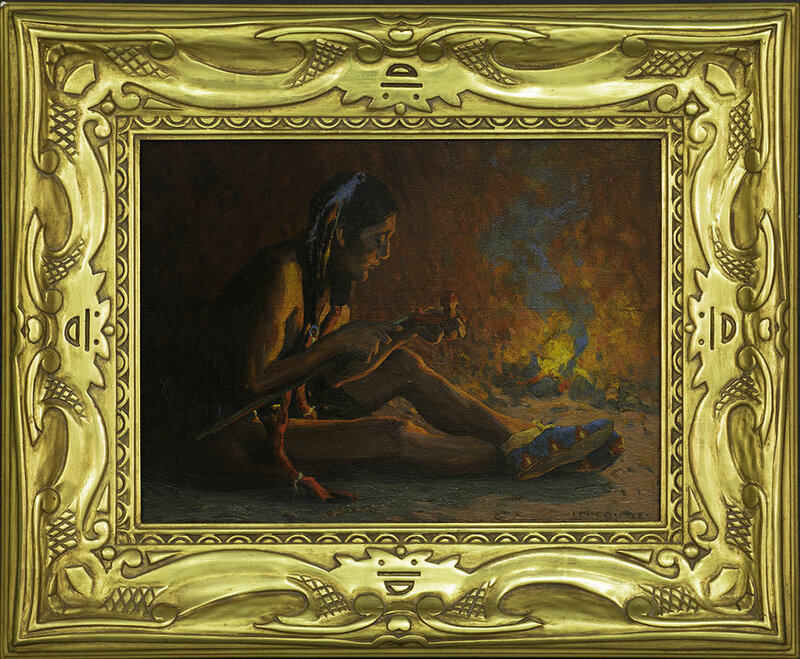 Eanger Irving Couse oil painting; estimate $125,000-150,000. The Saturday night Cody Old West Auction will see approximately 250 lots of authentic western fine art, artifacts and collectibles cross the block in front of a live audience. Fast-paced and exciting, items sell at an average of 60-70 lots per hour, or one every minute. Highlights of this year’s auction include a painting by Taos master Eanger Irving Couse (estimate $125,000-150,000); a mid-19th century Native American quilled man’s shirt (estimate $200,000-250,000); a ledger signed by both Nicholas Earp and Virgil Earp (estimate $20,000-30,000); A framed collection of John Wesley Hardin artifacts and signatures (estimate $25,000-30,000); and personal items belonging to Hollywood cowboys such as Roy Rogers, Tom Mix and John Wayne. The auction will be held at the Santa Fe Community Convention Center on Saturday, June 22nd at 5:00 p.m., and all lots may be previewed live onsite Friday and Saturday. Both the auction and preview are free and open to the public. Bidder registration is free, and bidding may be done live, or via phone, online, mobile or absentee. Catalogs are available for purchase for $30, or may be viewed online approximately 3 weeks before the sale. Discounts, details, schedules, hotel partners, auction highlights, vendor lists, FAQs and much more can be found at www.oldwestevents.com, by calling 480-779-9378, or visiting Facebook, Pinterest or Instagram. Under 12, over 70, active military, and Rodeo de Santa Fe patrons receive FREE general admission. Dealer set-up: Friday, June 21, 8am - 5pm. Early buy-in tickets available for $100. Auction and preview are both free and open to the public. Old West Events is home to Brian Lebel's Old West Shows and Old West Auctions, held every January in Mesa, Arizona, and every June in Santa Fe, New Mexico. Each annual event consists of a weekend vendor sale with hundreds of dealers, along with an exciting, live Saturday night auction. Both the events feature the best authentic western art, antiques and artifacts available for public sale. The Old West Auction is best known for the 2011 sale of the only authenticated photograph of Billy the Kid (the “Upham tintype”) for $2.3 million. Brian Lebel began the Cody Old West Show & Auction in June 1989 in Cody, Wyoming as a way to bring together like-minded collectors of cowboy and western antiques and trappings. The event was held in Cody every June for 19 years, before moving first to Denver, Colorado, then to Fort Worth, Texas, and finally to Santa Fe, New Mexico. In Spring of 2014, Lebel purchased the annual High Noon Show & Auction in Mesa, Arizona, and formed a new venture: Old West Events. The company prides itself on its reputation for honesty, quality and authenticity. The highly anticipated auction of the photography collection of Old West historian Robert G. McCubbin realized over $1.7 million in total sales on the first night of the historic weekend that ultimately realized over $3.1 million in total auction sales. Mesa, AZ - The 500+ people attending the live auction of the Robert G. McCubbin Photography Collection this past January 25th in Mesa, Arizona were treated to an exciting night of fantastic prices alongside great bargains. The top lot of the night was outlaw John Wesley Hardin’s personal photo album, (containing a rare tintype of Hardin himself), selling for $129,800, well over its low estimate of $75,000. Other high-performing photographs include the cabinet card of Ben Thompson that was inscribed to King Fisher and stained with Fisher’s own blood, which realized $94,400 (almost 4 times its low estimate); and the rare CDV of frontiersman James Beckwourth, which fetched $70,800 (estimate $20-30,000). In total, 30 lots sold for above $10,000, 17 lots sold above $20,000 and 7 lots sold for over $50,000. One of the most anticipated photographs of the evening – the famous “Fort Worth Five” Pinkerton photograph of Butch Cassidy and The Wild Bunch – realized $118,000 to a bidder on the sales floor. The Friday photography auction boasted a 100% sell-through rate. Successful though it was, the weekend was not without some drama. Approximately 30 lots of McCubbin ephemera were withdrawn just days before the sale. Consisting of Lincoln County, New Mexico Court documents, the lots were pulled as a result of requests from both the Lincoln County Clerk’s Office and the State of New Mexico Attorney General’s Office. On Saturday evening, excitement was created in the Auction preview room when, just prior to the beginning of the auction, a man attempted to remove a painting from the wall and exit the premises. He was detained by the Mesa Police and arrested on several criminal counts. The painting did not sustain any damage. Old West Events will host the 30th Annual Cody Old West Show & Auction this June 22-23, 2019 at the Santa Fe Community Convention Center in Santa Fe, New Mexico. Like the Mesa format, the event will consist of a weekend vendor show and accompanying Saturday night live auction. Dealer space for the show is sold out, though interested parties are encouraged to join the waiting list. Auction consignments are currently being considered for both the June 2019 and January 2020 sales. Next year’s Mesa Old West Show & Auction will mark the event’s 30th anniversary, and is scheduled to be held January 25-26, 2020. For more information on both events, visit www.oldwestevents.com or call 480-779-9378. The knife that outlaw Billy the Kid was holding when he was shot and killed by Pat Garrett will cross the block at Brian Lebel's 29th annual Old West Auction on January 26, 2019 as part of the sale of the Robert G. McCubbin Collection of Old West photographs and artifacts. Old West Events is proud to offer the Robert G. McCubbin Collection, January 25-26, 2019 at the 29th annual Mesa Old West Auction. Consisting of over 1,500 total pieces, it is regarded as the most extensive and important collection of Old West photographs, artifacts and documents in private hands. Among the many highlights is the Billy the Kid knife, estimated to sell for between $800,000 - 1.2 million. The photography portion of the collection will be sold Friday, January 25th; the documents and artifacts, including The Kid’s knife, will be sold on Saturday, January 26th. Auctions begin at 5:00 pm each evening; combined estimates exceed $6 million. Held at the Delta Marriott Mesa hotel in Mesa, AZ, both auctions are free and open to the public, and all lots may be previewed in person. Bidder registration is free, and bidding may be done live, online, by mobile app, via phone or absentee. Catalogs are available for purchase, or viewed online at https://auctions.oldwestevents.com. The McCubbin Collection is packed with rare and historic Old West memorabilia, but the knife that Billy the Kid was holding when he was killed is by far the most anticipated and highest estimated lot of both sales. The knife, which Billy was carrying to cut meat at the Maxwell family house, was still in Billy's hand when he was shot by Pat Garrett in Pete Maxwell's room July 14, 1881. Noted in numerous accounts of the time, the knife was retrieved by Paulita Maxwell and passed down through the Maxwell-Jamarillo family for over a century. It is accompanied by extensive provenance, including affidavits signed by Maxwell family members and others. Details and provenance may be viewed at www.oldwestevents.com/billythekidknife. Brian Lebel, auction owner, is thrilled to offer this exciting Old West artifact. Lebel’s June Old West Auction sold the only authenticated photograph of Billy the Kid (the “Upham tintype”) in 2011 for $2.3 million. Lebel states, “The Billy the Kid tintype was the ‘Holy Grail’ of the Western collecting industry; everyone said so, and I’ve always agreed. But the Billy the Kid knife is a pretty fine runner-up.” The collection includes numerous Kid-related items, including a “last-stand” note and signature that may, or may not, be that of William Bonney. Other notable artifacts from the McCubbin Collection include Wild Bill Hickok’s straight razor (est. $70,000-90,000), the mallet that killed Wild Bunch outlaw Ben Kilpatrick (est. $50,000-80,000), and John Wesley Hardin’s personal photo album (est. 75,000-125,000). The photography collection includes hundreds of highly sought-after original Old West photos of the most notable and notorious Western figures, as well as hundreds of important historical documents. Highlights may be viewed at www.oldwestevents.com/mccubbin-collection. In addition to the auctions, Old West Events will present the 29th annual Mesa Old West Show, a weekend dealer show and sale with over 180 vendors in western art, antiques and other fine merchandise. Details on all of the weekend events may be found at oldwestevents.com, facebook.com/oldwestevents, or by calling 480-779-9378. Old West Events is home to Brian Lebel's Old West Shows and Old West Auctions, held every January in Mesa, Arizona, and every June in Santa Fe, New Mexico. Each annual event consists of a weekend vendor show and sale, along with an exciting, live Saturday night auction. Both events feature the best authentic western art, antiques and artifacts available for public sale. The Old West Auction is best known for the 2011 sale of the only authenticated photograph of Billy the Kid (the “Upham tintype”) for $2.3 million. Brian Lebel began the Cody Old West Show & Auction in June 1989 in Cody, Wyoming as a way to bring together like-minded collectors of cowboy and western antiques and trappings. The event was held in Cody every June for 19 years, before moving first to Denver, Colorado, then to Fort Worth, Texas, and finally to Santa Fe, New Mexico. In 2014, Lebel purchased the annual January High Noon Show & Auction in Mesa, Arizona, and formed a new venture: Old West Events. The company prides itself on its reputation for honesty, quality and authenticity. Auction estimates exceed $6 million for the upcoming sale of the well-known Robert G. McCubbin Collection of Old West photographs and artifacts at Brian Lebel’s 29th annual Old West Auction, January 25-26th in Mesa, AZ. Among the photographic highlights are rare and historic photos of notable Old West figures such as Jesse James, Calamity Jane, Wild Bill Hickok, Bat Masterson, Belle Star, Yellowstone Kelly, Geronimo, Sitting Bull and many, many other famous and infamous names. The highest estimated photo is the original and famous studio portrait of Butch Cassidy, Sundance, and the Wild Bunch that helped to both cement their fame and doom them to capture, which McCubbin obtained directly from the Pinkerton National Detective Agency (estimate: $100,000-150,000). 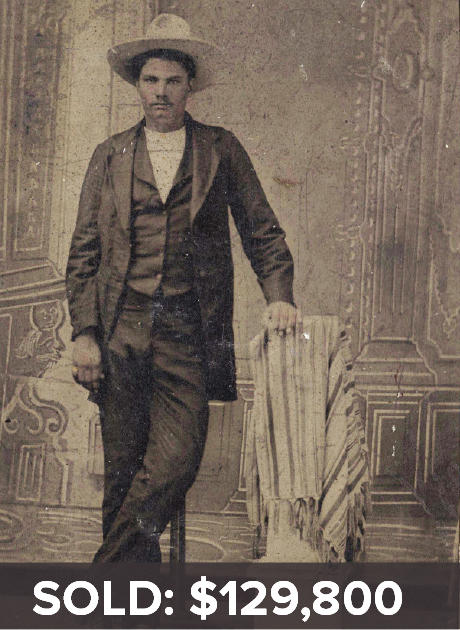 A tintype of John Wesley Hardin from Hardin’s personal album is among the rarities (est: $50,000-75,000), as is a Doc Holliday carte de visite (est: $70,000-90,000). The collection also features a number of important Old West artifacts, including the knife that Billy the Kid held when he was shot dead by Pat Garett in Pete Maxwell's room July 14, 1881 (estimate: $800,000-1.2 million). Other important artifacts include the ice mallet that killed Wild Bunch outlaw Ben Kilpatrick in the famous failed train robbery (est: $50,000-80,000), Rose of Cimarron's rifle (est: $150,000-200,000), and Wild Bill Hickok's straight razor (est: $70,000-90,000). The ephemera includes hundreds of original documents, including extensive archives related to James Dolan, the Lincoln County War and other important Old West figures and events. Auction owner Brian Lebel has known Robert McCubbin for almost 30 years, and is honored to work with him. Lebel says, “Bob has the passion of a collector, but the discipline of a scholar. It’s a rare combination that has resulted in him amassing an unparalleled collection of authentic and well-curated material.” McCubbin acquired many of his very rare and valuable items directly from the heirs and descendants of the legendary subjects, and as a result, many of the most important pieces in the collection are accompanied by impeccable provenance. Consisting of over 1,500 total pieces, McCubbin’s Collection will be sold both as individual items and grouped into lots across both auctions. Catalogs are available for purchase, or may be viewed online at https://auctions.oldwestevents.com. Complete details may be found at oldwestevents.com, facebook.com/oldwestevents, or by calling 480-779-9378. The silver saddle ridden by The Lone Ranger in the original 1950s TV series and films will cross the block on June 23rd at Brian Lebel’s annual Cody Old West Auction in Santa Fe, NM. Santa Fe, NM: The Cody Old West Auction is proud to offer one of the most iconic saddles of the golden era of the Hollywood cowboy: the Lone Ranger’s black and silver Edward H. Bohlin ensemble. The top estimated lot and catalog cover piece for the 29th annual Cody Old West Auction, the saddle appeared in almost every 1950s television and film production of “The Lone Ranger,” and was ridden by both Clayton Moore and John Hart in their portrayals of the Masked Man. From the Estate of Lone Ranger producer, Jack Wrather, the saddle was crafted by the master Hollywood saddlemaker, Edward Bohlin. Complete with bridle, breast collar, and massive tapaderos, the ensemble is estimated to sell for $40,000-60,000. Brian Lebel’s annual Cody Old West Show & Auction is moving to Santa Fe, NM June 23-24, 2018, featuring a weekend vendor sale of fine western Americana, along with a live Saturday night auction of authentic western art and artifacts. Brian Lebel’s Old West Events is excited to announce that their 29th annual summer event, the Cody Old West Show & Auction™, is moving to the Santa Fe Community Convention Center in Santa Fe, New Mexico, on Saturday and Sunday, June 23rd and 24th. The Old West Show will feature over 100 national dealers of authentic western art, antiques, apparel, décor, jewelry, collectibles, antique firearms, Native American arts and artifacts, photography, boots, books and other fine western merchandise in all price ranges. General admission is $10 per day, or $15 for a weekend pass. Attendees under 12, over 70, and active military receive free general admission. Early buy-in tickets are available for Friday entry during dealer set-up. Details, discounts, schedules and the complete vendor list can be found at oldwestevents.com. The Saturday night Old West Auction will see approximately 290 lots of authentic western fine art, artifacts and collectibles cross the block in front of a live audience. Fast-paced and exciting, items will sell at an average of 60-70 lots per hour, or one every minute. Among the highlights of this year’s auction are the Lone Ranger’s silver saddle from the 1950’s television series (estimate $40,000-60,000); a pair of police-used, engraved revolvers from famed 20th century Texas Ranger, Clint Peoples (estimate $12,000-16,000); antique and contemporary Southwest pueblo pottery from a noted Colorado collection ($2,000-10,000); and exceptionally rare, hand-painted, glass title art from the western TV series, “Have Gun - Will Travel” and “The Lone Ranger” (estimate $30,000-40,000 each). The auction will be held Saturday, June 23rd at 5:00 p.m., and all lots may be previewed live onsite Friday and Saturday. Both the auction and preview are free and open to the public. Bidder registration is free, and bidding may be done live, or via phone, online, mobile or absentee. Catalogs are available for purchase for $30, or may be viewed online. $10/day or $15/weekend. Under 12, over 70, and active military (with ID) receive free general admission. Dealer set-up: Friday, June 22, 8am - 5pm. Early entry tickets available for $100. 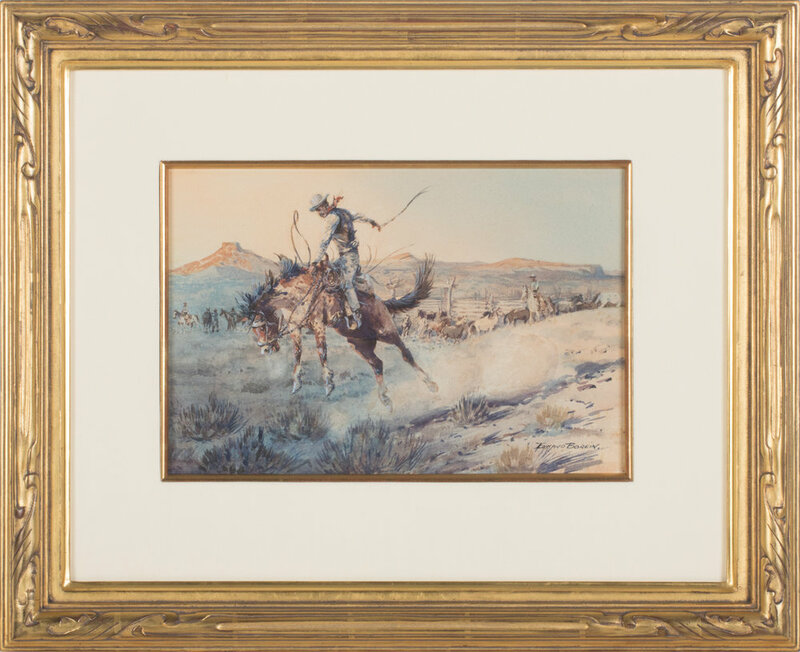 The top lot at Brian Lebel’s Mesa Old West Auction was an action-packed watercolor by cowboy artist Edward Borein that realized $76,700 in front of a packed house at the 28th annual sale. MESA, AZ – 305 auction lots crossed the block on Saturday evening, January 20th at Brian Lebel’s Mesa Old West Auction, held live at the Phoenix Marriott Mesa in Mesa, Ariz. Total live sales topped $1.1 million, with an impressive 94.3% sell-through rate. The auction opened to a standing room only crowd of approximately 600 people, with additional bidders on 2 Internet platforms and a busy phone bank, as well as brisk absentee bidding. The top seller of the night was lot 139, an Edward Borein watercolor that sold for $76,700, firmly within its $65,000 – 85,000 presale estimate. Lebel’s auctions traditionally do extremely well with Borein’s work, and hold a number of auction sales records for the artist. A smaller watercolor by the artist brought $12,980. The second highest selling lot was lot 201, a shirt, leggings and moccasins outfit that belonged to famed Apache Chief and Geronimo’s nephew, Asa Daklugie, which brought $56,050 to an absentee bidder. Continuing the recent trend, cowboy material was very strong. A Bohlin Rose Parade silver parade saddle that once belonged to Bob Tanner brought more than its high estimate of $40,000 realizing $47,200 to a determined phone bidder. Miniature saddles did exceptionally well, with the one-of-a-kind L.D. Stone salesman sample-sized saddle that almost doubled its low estimate, ultimately realizing $44,250 to a floor bidder in the room. The highly anticipated set of Duff Severe salesman sample-sized saddles that had once been displayed at the Smithsonian realized $26,550. Salesman sample saddles were not the only popular miniatures of the evening. A group of three Roy Luttrell miniature wagons each brought more than 4 times their high estimates of $4,000, selling for $18,800, $20,060 and $21,240 each after fast-paced bidding between a floor bidder and an absentee bidder. They were the runaway items of the night, resulting in a round of applause from the packed room. Hollywood cowboys did well, with a Matt Dillon “Gunsmoke” used Colt Single Action bringing $24,780 to a floor bidder, which was more than twice its low estimate of $10,000. Monte Hale’s Colt Single Action realized $9,440, almost 8 times its low estimate of $1,200. Who says the old Hollywood cowboys have been forgotten? The Old West Show saw record-breaking crowds on Saturday, and brisk dealer and early-buy-in sales on Friday. Vendors were extremely happy, and there were numerous reports of nearly sold-out booths and six-figure sales. Next year’s Mesa Event dates are January 26, 2019 for the Auction and Jan 26-27 for the Mesa Old West Show. The June Cody Old West Show & Auction will celebrate its 29th annual event this June 23-24, 2018 at its new venue in Santa Fe, NM at the Santa Fe Community Convention Center. Visit OldWestEvents.com for details. 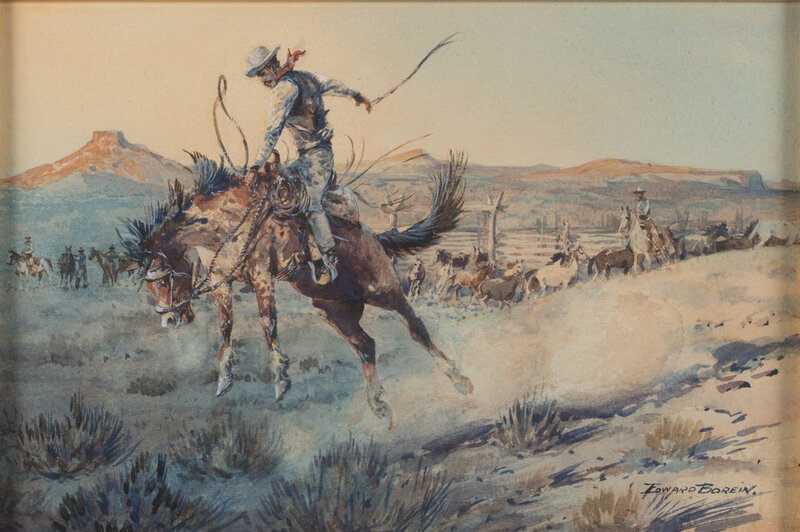 The 2018 Western art and antiques event season kicks-off with Brian Lebel’s Old West Show & Auction, January 20-21, 2018 in Mesa, AZ, featuring over 180 weekend show dealers, and over 300 live auction lots, including two fine watercolors by the western master, Edward Borein. Edward Borein, A Bucking Bronco, Watercolor , 8 3/4" x 13 1/4"
Mesa, AZ – 300-plus lots will cross the block on Saturday night, January 20th, at Brian Lebel’s annual Western Americana auction of authentic art, antiques and artifacts. Formerly known as the “High Noon Show & Auction,” the weekend event also includes a two-day dealer show and sale that hosts over 180 vendors in cowboy, American Western and Native American art, antiques and design. In the fine art category, the auction features works by both contemporary and deceased western artists, including a number of etchings, and two watercolors by the famous California painter, Ed Borein. Lebel’s auction holds a number of sales records for art by Borein, and hopes to continue that trend with the catalog cover lot, an action-packed Borein bucking horse that Lebel feels, “is among the very best Borein watercolors we’ve ever handled.” (est. $65-85,000). Other fine artists in the 2018 sale include Roseta Santiago, Mehl Lawson, A. Leslie Ross, Leonard Reedy, Olaf Wieghorst, Nicholas Firfires, William Gollings, Wilson Hurley, Fred Harman, Grant McDonald, John Moyers, Terri Kelly Moyers, Will James, Roy Luttrell, Eric Michaels, Alexander Phimister Proctor, and many others. Watercolor, 7 1/4" x 5 1/2"
Saddles are always a highlight at Lebel’s Old West Auctions, and this year is no exception. A rare Moran Bros. Territorial Exhibition saddle (est. $20-25,000), a Bohlin silver parade ensemble (est. $30-40,000), and a Maximillian Period silver-mounted Mexican saddle (est. $15-20,000), are a sample of the various styles and eras of saddles being offered. A number of important miniature and salesman sample saddles will also cross the block, including a collection of 4 half-scale Duff Severe saddles once featured in an exhibition at the Smithsonian Institution in Washington, D.C. (est. $50-70,000). Since purchasing the High Noon event in 2014, Lebel’s Old West Events has worked to grow the size and diversity of the weekend dealer Old West Show. Once known primarily as a Western antique show, the Mesa show now boasts over 30 additional vendors than in earlier years. “We got creative with space,” says Lebel, “and as a result we are able to host a more diverse selection of dealers overall; more contemporary artists and craftsmen especially.” The TCAA (Traditional Cowboy Arts Association) hosts their annual “Emerging Artists Competition” at the Mesa show, with the winner announced Saturday night at the opening of the live auction. A complete vendor list is available online. The 28th annual Mesa Old West Show will be held at the Mesa Convention Center from 9-4 on Saturday and 9-3 on Sunday, January 20-21, 2018. General admission is $10/day, kids under 12 are free. Discount tickets may be purchased online. A special Friday “early buy-in” is available for $100 for those who want to shop while the dealers unpack and set-up for the show. The 2018 Western art and antiques event season kicks-off with Brian Lebel’s Old West Show & Auction, January 20-21, 2018 in Mesa, AZ, featuring over 180 weekend show dealers, and over 300 live auction lots, including an outfit owned by Geronimo’s nephew and Apache chief, Asa (Ace) Daklugie. Also from the Apache region are fine Southwest baskets from the collection of Bill and Marilynn Lenox of Dallas, Texas (estimates from $300 to $5,000). A rare Comanche boy’s shirt will be offered (est. $6-8,000), as well as a striking Sioux beaded and ochre dress from the turn of the 20th century (est. $8-10,000). An 1871 Ulysses S. Grant peace medal will also cross the block (est. $10-12,000). The sale will include artifacts in all price ranges, including a classic and attractive pair of Plains beaded and hide moccasins (est. 6-700). Lebel’s auction holds a number of sales records for art by Edward Borein, and hopes to continue that trend with an action-packed Borein watercolor that Lebel feels, “is among the very best Borein watercolors we’ve ever handled.” (est. $65-85,000). Other fine artists in the 2018 sale include Wilson Hurley, David Mann, John Moyers, Roseta Santiago, Fred Harman, Olaf Wieghorst, and many others. In conjunction with the Auction, is the annual Mesa Old West Show. Over 180 national dealers save their best merchandise for the weekend show, which features the best in authentic western art, antiques, apparel, décor, collectibles, jewelry, books, boots, beadwork and much more. Since purchasing the High Noon event in 2014, Lebel has worked to grow the size and diversity of the weekend dealer show. Once known primarily as a Western antique show, the Mesa show now boasts over 30 additional vendors than in earlier years. “We got creative with space,” says Lebel, “and as a result we are able to host a more diverse selection of dealers overall; more contemporary artists and craftsmen especially.” The TCAA (Traditional Cowboy Arts Association) hosts their annual “Emerging Artists Competition” at the Mesa show, with the winner announced Saturday night at the opening of the live auction. A complete vendor list is available online at oldwestevents.com/vendor-list. The 28th annual Mesa Old West Auction will be held at the Phoenix Marriott Mesa, January 20, 2018 at 5:00 pm. Lots may be previewed for free on Friday and Saturday at the auction site. Bidding may be done live, online, mobile, by phone or absentee. Bidder registration is free, and both the auction and preview are free and open to the public. More information on both events, including discount show tickets and auction catalog sales, is available at www.oldwestevents.com or by calling 480-779-9378. Even more of Old West Events can be found on Facebook, Pinterest and Instagram, #MesaOldWest. The top lot at Brian Lebel’s 28th annual Old West Auction was a small watercolor by American frontier artist Alfred Jacob Miller that realized $141,600 after spirited bidding. FORT WORTH, TX – 420 auction lots crossed the block on the evening of June 10, 2017 at Brian Lebel’s Old West Auction, held live at the Amon G. Carter, Jr. Exhibits Hall of the Will Rogers Memorial Center in Fort Worth, Texas. Total sales were just shy of $1 million with an astonishing 94% sell-through rate. Approximately 300 people attended the live event, with several hundred more bidding on the Internet and phone. The top seller of the night was lot 179, an Alfred Jacob Miller watercolor that sold for $141,600, firmly within its $125,000 - 175,000 presale estimate. Miller traveled and painted the far American West in the early frontier years, and though he was not particularly famous in his lifetime, he is now considered among the greatest painters of the American West. As always, cowboy artifacts and trappings were strong sellers, with a custom and rare pair of Bob Boone spurs bringing $41,300 to an excited floor bidder, and realizing more than twice their low estimate. A pair of custom Bohlin spurs designed to commemorate the Texas Sesquicentennial realized an impressive $17,700. Also by Bohlin was a stunning “Beverly Special” parade saddle, which brought $20,650, just surpassing its high estimate of $20,000. There are always a few surprise run-away items, and this sale was no exception. A wonderful photograph of Buffalo Bill’s Wild West cast that had been taken at Auburn prison sold for $4,720, which was more than 5 times its low estimate. Also selling at more than 5 times its low estimate was a Colt revolver that had been used by actress Gail Davis in the television character of Annie Oakley. Estimated at $1,800 – 2,400, it sold for $10,030 to a phone bidder. Lebel’s Old West Events also hosts the annual Brian Lebel’s High Noon Show and Auction in Mesa, Arizona, which will be held January 20-21, 2018. For more information about either event, including how to become a Show vendor or Auction consignor, visit www.oldwestevents.com or call 480-779-9378. Custom Hudson and Bohlin buckles and other fine accessories from the personal collection of Harry Hudson of Dallas and Marfa fame, to be sold live at Brian Lebel’s Old West Auction June 10th. FORT WORTH, TX – Brian Lebel’s Old West Auction is proud to offer at auction fine custom buckles and similar items from the personal collection of Texas celebrity, Harry H. Hudson. The collection, of which approximately 16 pieces will be offered, includes custom designs by Hudson himself, as well as Edward H. Bohlin pieces. 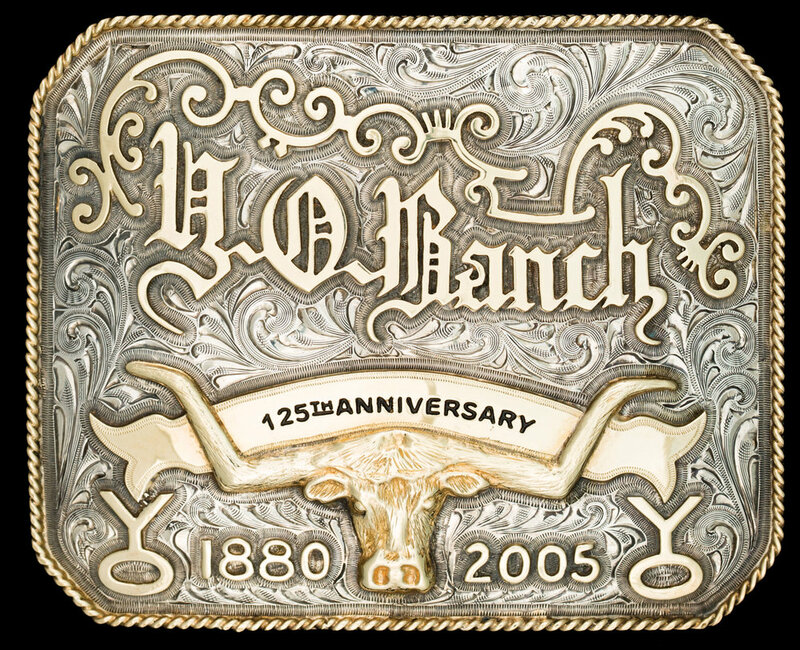 Among the Bohlin buckles is a YO Ranch trophy buckle in 18K gold and sterling that is estimated to sell for $5,500 – 7,500. The live auction will be held on June 10, 2017 in Fort Worth, TX. Over 400 lots total of authentic western art and artifacts are scheduled to cross the block that evening, with pre-auction estimates exceeding $1.4 million. All auction lots may be previewed on-site during auction weekend. Bidding may be done in-person, online, by telephone or absentee. Bidder registration, the auction, and preview are all free and open to the public. A full-color, auction catalog is available for purchase, or lots may be viewed online at bid.oldwestevents.com. The auction is held in conjunction with a weekend western fine art and antiquities show featuring over 100 nationwide vendors. Both the show and auction are held at the Amon G. Carter Jr Exhibits Hall at the Will Rogers Memorial Center in the Fort Worth Cultural District. Details, auction highlights, catalog sales and much more are available at: www.oldwestevents.com or by calling 480-779-9378. Items from Snuff Garrett’s legendary collection of Hollywood Cowboy Memorabilia will be sold at Brian Lebel’s Old West Auction, June 10, 2017 in Fort Worth, TX. FORT WORTH, TX – Old West Events is pleased to announce Part II of the auction of items from Snuff Garrett’s Fine Western Collection. One of the most successful American record producers of all time, Snuff Garrett was raised in the golden era of the Hollywood cowboy, and his collection includes original movie posters, fine art, photographs, Edward H. Bohlin custom work, and iconic Hollywood memorabilia. Approximately 70 pieces from Snuff’s personal collection will be offered at the annual sale, which will be held live on June 10, 2017 in Fort Worth, TX. Over 400 lots total of authentic western art and artifacts are scheduled to cross the block that evening, with pre-auction estimates exceeding $1.4 million. Thomas Lesslie “Snuff” Garrett was born in Dallas, Texas. He dropped out of high school, became a disc jockey in Lubbock, and went on to become the most successful record producer of the 1960s and 1970s. A few of his stable of artists included Bobby Vee, Gary Lewis & the Playboys, Johnny Burnette, Del Shannon, Cher, Brenda Lee, Nancy Sinatra and countless others. He worked with Phil Spector, Carole King, Leon Russell, Clint Eastwood and Burt Reynolds. Snuff’s great talent was his ability to know a hit song when he heard one, and know who should sing it. He was, to everyone’s agreement, a genius in that respect. Snuff loved music, and he loved art. Along with his music friends, and Hollywood friends, Snuff had artist friends. Olaf Wieghorst, Joe Beeler, Michael Coleman, Fred Harman, Bob Scriber, Grant Speed and many others. Snuff’s home was filled with art from his cowboy artist buddies. It was also filled with movie posters. Framed original lithographs hung floor to ceiling, featuring the antics of Tom Mix, Roy Rogers, Rex Allen and the others. He also loved the flash and fashion of the Hollywood cowboy, and purchased the famous Bohlin Company shortly after Ed Bohlin’s death. His custom Bohlin pieces are as fun as he was. These are a few of the pieces from Snuff’s lifetime collection to be offered at this special June sale. The first firearm to be forensically proven to have been at The Battle of the Little Bighorn sold for over a quarter of a million dollars at the 27th annual Brian Lebel’s High Noon Auction in Mesa, Arizona. MESA, AZ – It was standing room only with a crowd of nearly 800 people at the 27th annual live auction of authentic Western art and artifacts, where 435 lots crossed the block at the Phoenix Marriott Mesa for Brian Lebel’s High Noon auction presented by Old West Events. Total sales topped $1.5 million, with the top lot of the night – the historic, Indian-used Custer Battlefield Sharps Rifle – bringing $258,750 to a bidder on the phone. With nearly as many registered phone and Internet bidders and live bidders, the bidding was fast-paced and exciting, with an overall sell-through rate of 92.6%. Roy Rogers' Nudie's suit (from the Estate of Snuff Garrett), shown in this publicity shot, sold for more than twice its low estimate, bringing $12,260. Cowboy trappings were particularly strong this sale, with an impressive pair of spurs that belonged to the legendary Charlie Sample bringing above estimate at $34,500. A stunning engraved Colt Single Action realized over triple its low estimate, selling for $18,150. The first of two Old West Events auctions offering items from the estate of Snuff Garrett, the sale proved that both Snuff and his collections remain well remembered and respected. Snuff’s Roy Rogers Nudies outfit, for example, brought $12,260, more than twice its low estimate. Old West Events also hosts a weekend vendor show in conjunction with the auction. The show drew a record number of vendors at 183, as well as record breaking attendance numbers, with well over 3,000 people attending. Numerous vendors reported having, “Our best show ever!” or “Our best Mesa sales ever!” Says Lebel, “Early buy-in was extremely high, and Saturday crowds were unlike any we’ve seen in over a decade.” Next year’s 28th annual Mesa show and auction is scheduled for January 20-21, 2018, and the annual Fort Worth Show & Auction will be held this June 10-11, 2017. More information on all of Old West Events’ shows and auctions – including the full prices realized list for the current Mesa sale – can be found on the website www.oldwestevents.com or by calling 480-779-9378. Items from Snuff Garrett’s legendary collection of Hollywood Cowboy Memorabilia will be sold at Brian Lebel’s Old West Auction, January 21, 2017 in Mesa, Arizona. Snuff Garrett and Roy Rogers. Mesa, AZ – Old West Events is pleased to announce the auction of items from Snuff Garrett’s Fine Western Collection. One of the most successful American record producers of all time, Snuff Garrett was raised in the golden era of the Hollywood cowboy, and his collection includes original movie posters, fine art, Nudie’s Rodeo Tailor outfits, Edward H. Bohlin custom work, and Roy Rogers’ personal items. Over 80 pieces* from Snuff’s collection will be offered at the 28th annual sale, which will be held live on January 21, 2017 in Mesa, Arizona. An overall total of 439 lots of authentic western art and artifacts are scheduled to cross the block that evening, with pre-auction estimates exceeding $2 million. Snuff's custom Charlie Russell Riders Directors Chair. Estimate $800-1,400. An auction preview is held on-site during auction weekend. Bidding may be done in-person, online, by telephone or absentee. The auction, bidder registration, and the auction preview are all free and open to the public. A full-color, auction catalog is available for purchase, or lots may be viewed online at bid.oldwestevents.com. The auction is held in conjunction with a weekend-long western art and antique show. The show is held at the Mesa Convention Center; the auction is held at the adjacent Phoenix Marriot Mesa. Details, auction highlights, catalog sales and much more are available at: www.oldwestevents.com or by calling 480-779-9378. Roy Rogers' double eagle boots that he gifted to Snuff. Estimate $3,000-3,500. Snuff loved music, and he loved art. Along with his music friends, and Hollywood friends, Snuff had artist friends. Olaf Wieghorst, Joe Beeler, Michael Coleman, John Hampton, Tom Ryan, Gary Niblett, Harley Brown and many others. Snuff’s home was filled with art from his cowboy artist buddies. It was also filled with movie posters. Framed original lithographs hung floor to ceiling, featuring the antics of Tom Mix, Roy Rogers, Rex Allen and the others. These are among the pieces being offered for auction in January and June. Of his many famous friends, Roy Rogers and Snuff had a particularly special relationship. Snuff grew up on Hollywood cowboys and he worshipped Roy. When, as an adult, he met and worked with Roy, the two became fast friends. Frequently Snuff referred to Roy as a “father figure.” It was clear in the way that Snuff emulated Roy (from his suits to his boots), that he had great respect for the man. They remained dear friends for life. Personal pieces given by Roy to Snuff are included in the sale, including a pair of Roy’s iconic double eagle cowboy boots. Snuff and his friend, Western artist Olaf Wieghorst. John Wayne’s movie-worn shirt, Roy Rogers’ eagle boots, and Tom Mix’s batwing chaps are among the memorabilia of the golden era of the Hollywood cowboy that will cross the block at Brian Lebel’s Old West Auction on January 21st in Mesa, Arizona. Label from John Wayne movie shirt by Western Costume Co. Estimate $3,000-4,000. Mesa, AZ – Hollywood cowboys are coming to the desert at Old West Events’ annual live auction of authentic western art and artifacts, including personal items from the some of the most famous film and television cowboys of our time. Among the notable collectibles being offered is a John Wayne shirt by Western Costume Co. that Wayne wore in numerous films (estimate $3,000-4,000); a number of personal items from Roy Rogers, including boots, hats and photographs; and many lots related to Tom Mix, both personal items and original lithograph posters. 439 total lots will be offered at the sale on Saturday night, January 21st, with pre-auction estimates totaling over $2.2 million. Tom Mix original lithograph poster. All lots may be previewed on-site during auction weekend. Bidding may be done live, online, by telephone or absentee. The auction and preview are both free and open to the public. A full-color, auction catalog is available for purchase, or lots may be viewed online at bid.oldwestevents.com. The auction is held in conjunction with a weekend-long western art and antique vendor show. The show is held at the Mesa Convention Center; the auction is held at the adjacent Phoenix Marriot Mesa. Details, auction highlights, catalog sales and much more is available at: www.oldwestevents.com or by calling 480-779-9378. Tom Mix's personal Stetson hat with original box. Estimate $3,000-4,000. Notable among the Tom Mix items for auction are his personal batwing chaps (estimate $15,000-25,000); a Stetson hat with its original box (est. $3,000-4,000); custom cowboy boots (est. $8,000-12,000); and a custom pair of Bob Baldwin, Canon City Penitentiary made spurs with Edward H. Bohlin straps (est. $20,000-30,000). In addition to Roy Rogers’ red-white-and-blue double eagle boots (est. $3,000-3,500), is an iconic Roy Rogers’ Nudie’s Rodeo Tailor outfit (estimate $5,000-8,000), and a Nudie’s hat with silver hatband that is inscribed by Roy to his friend, famed record producer, Snuff Garrett (est. $2,000-2,500). Other Hollywood cowboys represented in the sale include Rex Allen, Tim McCoy, James Arness, Gene Autry, Monte Montana and Will Rogers. A leather and beaded necklace that once belonged to Geronimo, and a signature purchased in 1893 from the famed Apache warrior, will both be offered at auction on January 21, 2017 at Brian Lebel’s Old West Auction in Mesa, Arizona. Relic condition necklace that belonged to Geronimo. Estimate $20,000-30,000. Mesa, AZ – 439 total lots are scheduled to cross the block on Saturday night, January 21st, at Old West Events’ annual live auction of authentic western art and artifacts, with pre-auction estimates totaling over $2.2 million. Among the many historic items being offered are two that are directly related to the infamous Apache hero, Geronimo: his necklace (estimate $20,000-30,000), and a framed, original signature (estimate $3,000-4,000). Copy of 1958 newspaper article featuring the story of Geronimo's necklace. Another auction item with Native American history is the top estimated lot of the evening, an 1874 Sharps rifle that was forensically proven to have been used by Indian warriors at Custer’s Last Stand. The gun, which has been featured in numerous books and publications, is estimated to sell for between $300,000 – 500,000. The first firearm forensically proven to have been used at the Battle of The Little Bighorn will be auctioned at Brian Lebel’s Old West Auction in Mesa, Arizona, January 21, 2017. 439 lots will cross the block on Saturday night, January 21st, at Brian Lebel’s Old West Events’ annual live auction of authentic western art and artifacts, with pre-auction estimates totaling over $2 million. The top estimated lot of the evening is an 1874 Sharps rifle, forensically proven to have been used by Native American warriors at Custer’s Last Stand. The lot includes copies of provenance and forensics. The gun, which has been featured in numerous books and publications, is estimated to sell for between $300,000 – 500,000. The auction is held in conjunction with a weekend western antique show, and an auction preview is held during show hours. Auction bidding may be done live, online, by telephone or absentee. The auction and preview are both free and open to the public. A full-color, auction catalog is available for purchase, or lots may be viewed online. Details, auction highlights, catalog sales and much more is available at: www.oldwestevents.com or by calling 480-779-9378. View additional photos of this lot at our online auction catalog by clicking here. View the entire online catalog here. In 1883, seven years after the resounding defeat of Custer and his 7th Cavalry near the Little Bighorn River in Montana Territory, a rancher by the name of Willis Spear collected a number of artifacts while passing through the battlefield site with his family; a visit he recorded in his diary. This Sharps rifle, serial number C54586, was among the items he removed. It would remain in the Spear family for over a century. In August 1983, more than 100 years after what is among the most famous battles fought on American soil, a grassfire raged across the plains of the Custer Battlefield National Monument. This fire, having denuded the land of its thick grassy vegetation, paved the way for an archeological study that would exponentially further our knowledge of that fateful battle. In the Spring of 1984, with funding from the Custer Battlefield Museum and Historical Association, and support from the National Park Service, an intensive archeological survey and excavation was conducted, in which thousands of artifacts were recovered and recorded, over 2,000 of which were battle-related ammunition artifacts such as cartridges, casings and the like. Using modern day archeological, forensic and ballistic techniques, the investigators were able to determine hundreds of individual gun makes and models used at the battle, the locations of their use, and even track the movement of individual weapons across the battlefield. The .50-70 in question is Sharps serial number C54586, the Spear family’s rifle. Shipped new from the Sharps factory in 1875, it still exists today as a genuine, Indian-used artifact of the most infamous battle of the American West. Shop, sell, browse, learn and explore the Old West at Brian Lebel’s High Noon Show & Auction’s 27th annual event, with a weekend vendor sale, and exciting live Saturday auction, in Mesa, Ariz, Jan 21-22, 2017. Mesa, AZ - December 2016: Brian Lebel’s High Noon Show & Auction returns to Mesa this January to celebrate its 27th year as the Southwest’s premiere event for collectors, dealers and enthusiasts of the art and collectibles of the Old West and the western lifestyle. Consisting of a weekend-long vendor sale of 170 dealers, and a live Saturday night auction of more than 400 lots, the weekend showcases the very best in authentic cowboy, Indian and western art, antiques, artifacts and other fine merchandise. The Show will be held at the Mesa Convention Center, January 21-22, 2017; the Auction takes place at the adjacent Phoenix Marriott Mesa on Saturday, January 21st at 5:00 pm. Lebel’s weekend dealer show hosts over 170 vendors from around the country, offering authentic western art, antiques, apparel, jewelry, furniture, antique & historic firearms, books, boots, spurs, horse gear, cowboy trappings, collectibles and much more. General admission to the show is $10 per day, kids under 12 free. The annual Traditional Cowboy Arts Association “Emerging Artist” competition will be held during the show, with a People’s Choice Vote and cash awards. This year’s contest category is saddlemaking. The live Saturday night auction will see over 400 lots of authentic western art and artifacts cross the block, with pre-sale estimates exceeding $2.2 million. The highest estimated lot of this year’s exciting sale is a Model 1874 Sharps Rifle with provenance to the Custer Battlefield. Estimated at $300,000 – 500,000, this firearm was the first to be forensically proven to have been at the Battle of Little Big Horn, and can be traced to two known Indian positions on the battlefield. All lots are open to preview on-site, and bidding may be done live, online, by telephone or absentee. The auction and preview are both free and open to the public. A full-color, auction catalog is available for purchase, or lots may be viewed online. Additional auction highlights include a number of important estates, including that of legendary record producer, Snuff Garret. His impressive collection includes rare and desirable lithographs from the golden age of the Hollywood cowboy; personal items from Roy Rogers (whom Snuff often referred to as his “adopted father”) including a pair of Roy’s iconic double-eagle boots; and a number of custom and personalized Edward H. Bohlin pieces from the time when Snuff owned the Bohlin Company. Show and auction details, highlights, vendor lists, catalogs, tickets and much more are available at: www.oldwestevents.com or by calling 480-779-9378. $10 per day, under 12 fee. Free parking. Discount tickets and Friday early buy-in tickets available online. Auction and Preview both free and open to the public. Catalogs available for purchase ($30 US) or view online.